outside court where Taylor’s battle was being heard in 2007. There is something discordant in the federal government’s view of citizenship and what it means to be Canadian. Somehow it was important to spend more than $28 million marking the War of 1812 as a “Canadian” war. Yet, repeatedly in Federal Court, the Federal Court of Appeal and even the Supreme Court, there is a complete avowal by the federal government that before 1947 there was any such thing as a Canadian. Click here to read original article in the Vancouver Sun. That means what historians have long said: The War of 1812 was a British war, not a Canadian one. More surprisingly, Ottawa’s argument means that Canadians fighting during the Second World War are also not deemed to have been Canadian. All of which would be just a mere curiosity if it weren’t for the fact that even now peoples’ lives and identity literally depends on the courts’ interpretation. Jacqueline Scott is one of those people. The Surrey grandmother’s case begins Monday in the Federal Court of Appeal in Vancouver. 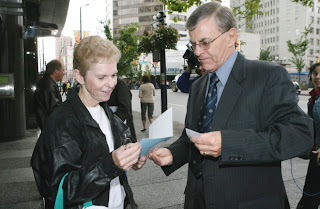 Scott’s father – James Ellis — was born in Canada and was serving in the Canadian Army when he met Winifred Lucy. Scott was born June 29, 1945 in England before her parents had a chance to marry. Because she was born out of wedlock and illegitimate – to use the quaint, but hurtful terms of the day – Scott is not deemed to be Canadian. Had her parents married before her birth, they would be no question that she like the thousands of other sons and daughters of servicemen and their war brides would have citizenship. But they weren’t married until 1948 when Scott and her mother finally arrived in Canada. They didn’t come on one of the many ships that carried war brides and their children. They missed the boats because Scott was deathly ill and required several surgeries. The government-sponsored transport of brides and children had ended by the time Scott was well enough to travel. The stigma of having had a child out of wedlock was so strong that Scott’s parents hid the fact from their daughter. Scott’s mother falsified her marriage certificate, backdating it to May 1945, which is why their big 50th wedding anniversary party was in 1995. Somehow Scott found out about it when she was in her teens. After confronting her parents and demanding the truth, none of them ever spoke of it again. Scott’s mother applied for and received Canadian citizenship in 1955. But rather than applying under a special section for ‘legitimized’ ‘out-of-wedlock’ children, the Ellises chose not to pursue it on behalf of their daughter. Bizarrely, federal government lawyers suggest in their response to Scott’s appeal that she was someone responsible for that decision. Scott was 10 years old, hardly an age when she could – legally or otherwise — make her own choices. Even now, the Canadian government only accepts citizenship applications from people 18 and older. In the intervening years, Scott went to school and worked in Ontario and later Vancouver. She paid taxes, voted in elections, married and gave birth to her daughter in Canada (which means that both Scott’s daughter and grandchildren are automatically Canadian). In 1972, Scott’s husband got a job in the United States after the Vancouver company he worked for went bankrupt. In 2005 and lacking travel documents to go anywhere, Scott became an American. But only after she’d been denied a Canadian passport and told that she is not Canadian. Pursuing Canadian citizenship then was not an option. Her mother was still alive and Scott didn’t want to embarrass her by bringing up the facts of her birth. But after her mother’s death, Scott set out to reclaim the citizenship that she believes is rightly hers. Despite her American passport, Scott maintains that in her heart and mind she’s never been anything but Canadian. It’s not about getting government-funded health care – her husband’s retirement benefits already cover them. And it’s not about getting other benefits – both she and her husband already collect CPP based on their contributions before they moved to the United States. What she wants is to be officially recognized for who she is: A Canadian daughter of a Canadian serviceman, a man both she and her mother loved and cherished. Canada disagrees on all counts. But in the first round in Federal Court, it says if there was discrimination it was justifiable. It maintains that position that Scott is not and never has been a Canadian. But because Scott has long surpassed the three-year residency requirement to apply for citizenship, the government lawyers note that if she really wants to be a Canadian, she can fill out the forms, pay her $200 and hope for the best.